I have fulfilled another entry on my foodie bucket list. Okay, I’m lying. 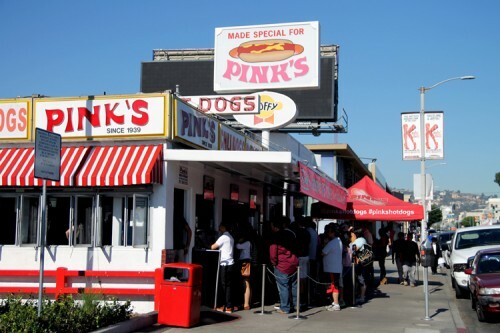 I am way too lazy to have made a foodie bucket list, but if I had, Pink’s Hot Dogs would assuredly be on it. Since 1939, the Pink family has been perfecting the hot dog, and as all good Californians know, perfecting = adding lots of toppings. Though I soon discovered that these dogs are more than what meets the eye. They’re also just darn good hot dogs! Sidle up to that window to place your order. Oh, who am I kidding? There’s going to be a line. No mere sidling up is possible. 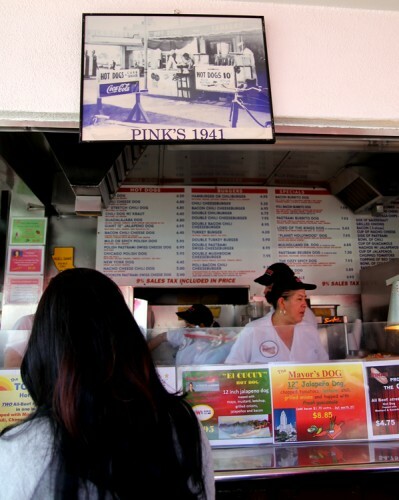 When I went on a weekday afternoon, the line consisted of roughly 30 people, and the ones in front of me had driven out from Reseda, thinking the day after Thanksgiving a good one to finally give Pink’s a try. I’m pretty sure we did have a light traffic day—it took me about 20 minutes to place my order. And frankly, I needed every one of those minutes because the options are many! 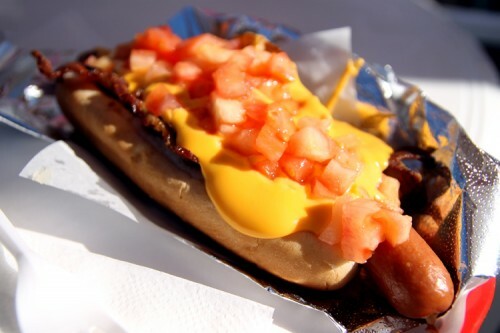 From a plain dog to the Three Dog Night with yes, 3 hot dogs wrapped in a tortilla, 3 slices of cheese, 3 slices of bacon, chili, and onions, Pink’s serves up the spectrum of any conceivable combination. Did you not see me type “wrapped in a tortilla”?! ANY CONCEIVABLE COMBINATION. Most of the super star dogs are named after celebrities, iconic Los Angeles sights, or movies. A number of them are actually the exact dogs that the named celebrities ordered when visiting the shop. You can get a regular-sized dog or a polish sausage, but you are really missing out if you don’t opt for a stretch dog at 9″ long. Of course, you could also choose one of Pink’s multiple hamburger options instead, but why would you? Imagine me giving you a disapproving look now. Yes, I have shamed you. Do order a side of fries, though. They can be topped with whatever you want that comes on a dog. The fries looked very good and I still regret forgoing them in the name of counting calories. I was a fool. Now I have shamed myself. Once your order is placed, wait inside for it to be cooked and then pay at the register. Seeing plenty of seating was a welcome sight after all that waiting. 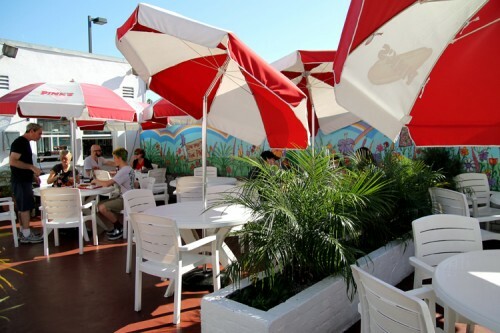 I recommend the patio area. The dog I chose was the Mulholland Drive, which is a stretch dog that comes with grilled onions, grilled mushrooms, nacho cheese, and bacon. I had them hold the mushrooms and use diced tomato instead. Why those specific requests? Well, my ideal dog was born from when my mom and I used to stop in at Orange Julius during trips to the mall. We’d both get a Julius and a nacho dog, which was always topped with nacho cheese and tomatoes. I have loved the combination ever since. And I still do. The crisp bacon strips lent a good, smoky flavor, and the other toppings played me like a nostalgic fiddle. The dog itself surpassed my expectations. The outer casing of the Hoffy-brand, all-beef frank had a wonderful snap, and the insides were moist enough to fling some liquid when I bit in. My only gripe would be that the buns are merely warmed and served. I much prefer bread that’s been kissed by a grill. Maybe I just need to try the tortilla instead next time? If you’re interested in seeing all those crazy combinations, Serious Eats actually ordered, photographed, and consumed them in 2013! That slideshow is located here. We took my Grandma there for her 83rd birthday and it was awesome!!! 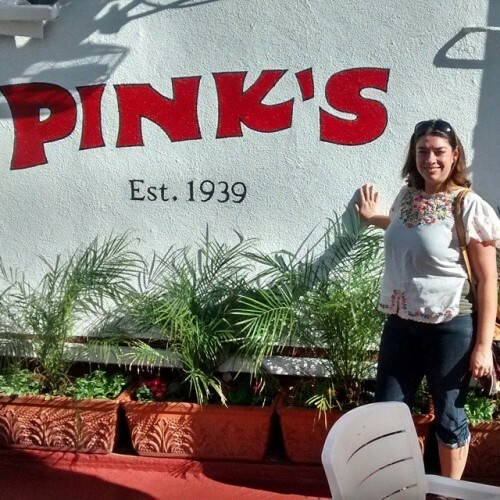 A northern California sister restaurant would be superb.